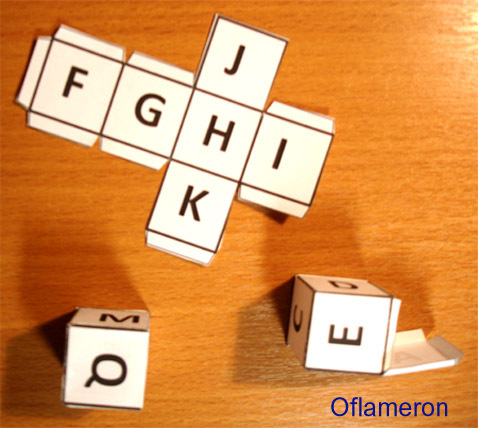 The board game made of paper "OFLAMERON" may be used to learn foreign languages (for example, Spanish or French). The game allows to train one's vocabulary effectively. Of course, it is possible to lay out very big and difficult game fields for the game "OFLAMERON". The more cards are used, the more paths the game field has, the more interesting it is to play. A few pupils aged at least 6-7 may participate in the training game. Usual game pieces and a die shall be required for game. A TRANSLATION of 10-15 French words is issued to players. Players move their game pieces on cards throwing the die and "collect" the French letters. It is necessary to make any French words of collected letters with the length of 4 letters least including those words the TRANSLATION of which is issued to the players. The game begins when participants put their game pieces ON ANY CELLS of the game field and write down the letters occupied by their game pieces on their leaflets. Then players throw in turn the die and move game pieces CLOCKWISE by the number of cells equal to the number on the die. Write down occupied letters on the leaflet and again throw the die and game pieces, etc. If the paths split, the player defines by him(her)self in what direction to continue the movement of the game piece. Players collect letters, and at some moment it becomes possible to make a French word of them and to announce its translation. 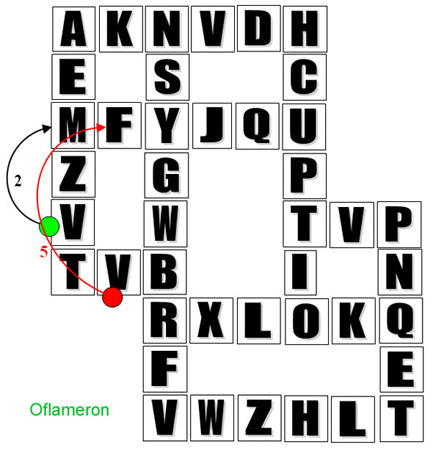 The player receives as many points to his/her score for each made word as many letters contains the French word made. If a player makes a French word but can't announce its correct translation, the points are received by that participant who announces the word translation correctly. Players make the French words of those letters that were collected by them. The used letters are struck off the player's list and should be "collected" again. For example, a player has collected the letters P, X, R, I, M, E, E, L, W, E. The word EXEMPLE (French) was made. After it the player will have letters X, R, I, W only in his/her list. The players will make and announce many French words and they will be not only those words the TRANSLATION of which was set in the beginning. During the game the participants will make much more words, than was set. If a player makes a French word the TRANSLATION of which was set before the game, then the points received for this word shall be doubled. 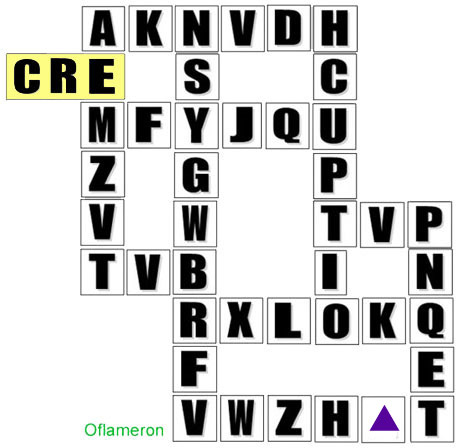 If a player has made a French word which is the longest in this game session (the current record), then the points received for this word shall be tripled. The teacher may interfere in the game process. If players cannot collect some letters though they all already know this French word, the teacher may replace some already "collected" French letters on the game field with the required letters taking necessary cards from the pack. Participants may prompt each other during the game - it helps studying and remembering foreign words. In total, much more French words shall be made and announced during the game than those 10-15 TRANSLATION words which were set at the beginning. The game comes to an end when all French words the TRANSLATION of which was set in the beginning are made and announced. The number of points received by every player is counted and the winner is named. If a few players received the same number of points, the one who made the longest word is the winner. If it is not sufficient, the count of the "current records" quantity shall help. While playing, the participants have to recollect in memory the French words, selecting from them those corresponding to the set of letters available. It ensures high efficiency of training. After several game sessions, the pupils will make phrases in a foreign language much quicker. As the pupils gain experience in playing the game it is possible to add new functions to it to preserve the pupil's interest in playing the game. 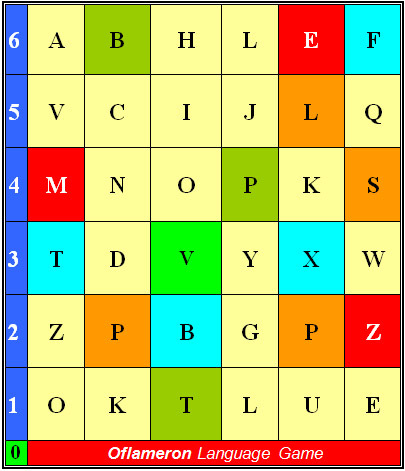 Fragments of the French words may be added to the game field (highlighted in yellow). On the one hand, the player receives not a single French letter at once, but a few. But on the other hand, he/she has to collect letters for only one or a few words the fragment of which is issued to him/her. If you enter fragments of long words in game, it is desirable to place the greater part of the word on the card. For example, for the word LE CONTENU it is necessary to use the CONT... card. At the same time, if the card allows making several French words, it is not taken from the game field. For example, CONT... card allows making the words LE CONTENU, CONTROLE and etc. When all options are used, such card is removed from the game field and replaced with a usual card with a letter or a card with a figure (see below). 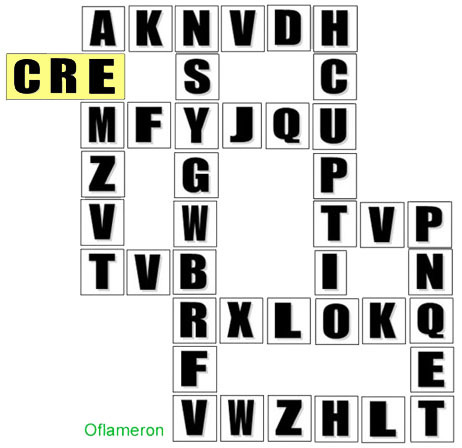 This game "OFLAMERON" variant should be offered to already experienced players or played with the teacher. This variant is convenient for learning new words. Cards with numeric values allow implementing the system of bonuses and making the game more interesting. - the player acquires the right to throw the die so many times at a run, to move the game piece and to collect letters as many times are specified on the card (2 or 4 times), but at the same time he/she may announce one made word. The specific manner of use of the numerical cards is agreed before the game. It is possible to introduce drawing up whole phrases in the game for advanced pupils. For this purpose, the card with a triangle face value is used in the game. If the game piece of the player occupies such a card with the triangle, the teacher issues to the participant the cards prepared in advance with the phrases lacking a part of letters. For example, ...GUE ETRA...RELANGUE ETRANGERE"). Here it is necessary to specify the translation of the phrase to be made. It is possible to adjust finely the complexity of the task for the players by changing the quantity of the missing letters in phrases. It should be done by the teacher. 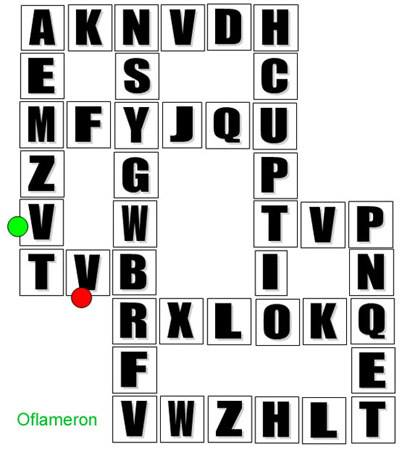 In usual variant the game "OFLAMERON" takes 2-3 hours. It is not always convenient. You can use the blitz version of the game. 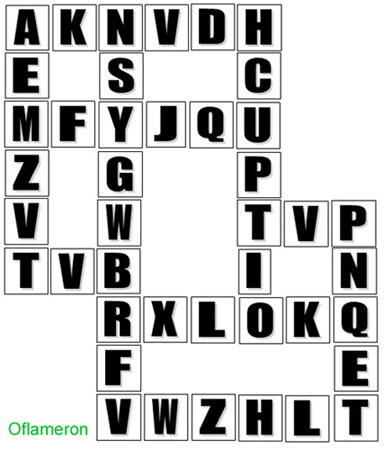 It requires from the player to announce a Spanish word beginning with each letter which is occupied by his/her game piece on the game field. The made words are written down in the leaflet to avoid repetitions. Points are counted in the same manner as in the previous variant of the game. Blitz game lasts for 20-30 minutes until a player is not able to announce a French word. Such a training may be carried out in any conditions. If you have no ready cards with letters, you can easily make them of any paper. You are just to know the rules of the game. If to replace French letters with letters of other alphabet, it becomes possible to learn any European language. 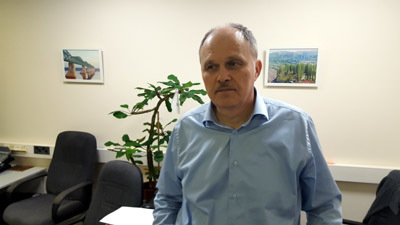 Teaching method and all materials of game are authentic, developed by Valery V Shmeleff (author) and protected by copyright.